It’s hard to believe it’s already been a month since my family’s Spring Break getaway to Disneyland. Our annual trip is in celebration of my daughter’s birthday. We skip the expensive, stressful, and unsatisfying birthday parties for a full week at the happiest place on Earth. Yes, I said a week. While most guests opt for multi-day passes to the theme parks, it’s almost unheard of for guests to spend more than three days there. We took advantage of a spring special at the Disneyland parks and decided to enjoy the parks for five days. Like a full-time job, we were there from Monday through Friday. Unlike a full-time job, though, we were there for nearly 12 hours per day. I don’t know about you, but when I spend a lot of money one something (*cough* thousands of dollars), I like to make the best of it. Fortunately, my daughter is now 7 years old and can put up with a full day at a theme park. It’s my goal every year to share my thrifted Disneyland outfits with my followers. Unfortunately, high traffic days also mean high anxiety, so taking pictures turn out to be a lot more stressful than originally anticipated. 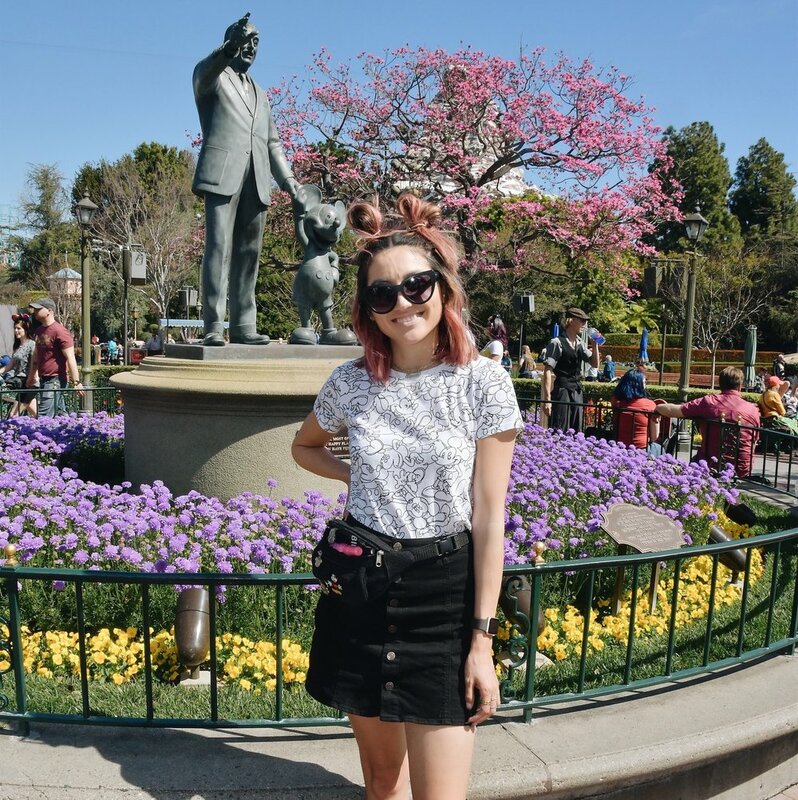 However, thanks to my husband’s patience and insistence, I did manage to get some decent pictures that might help you when planning your outfits for your next Disneyland adventure. Everything I wore (minus the shoes) was thrifted from local Goodwill of Central and Northern Arizona stores. I even scored the amazing Disneyland fanny pack a few months ago for $1! Keep in mind I visited the park during spring break, so mornings and evenings tend to get a little chilly. I highly recommend checking the weather before packing your bags. 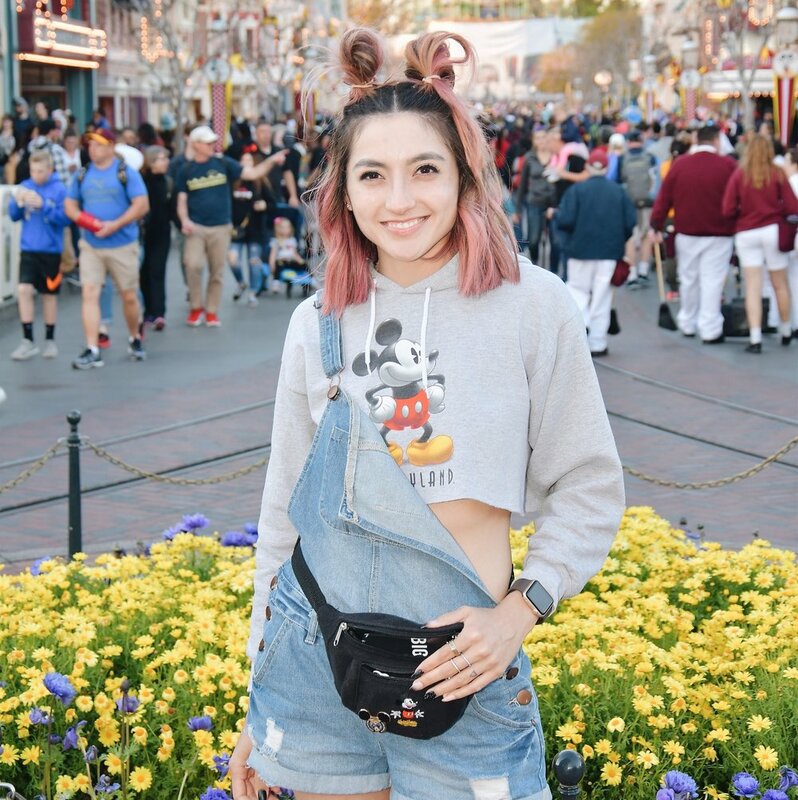 I hope this post helps you put together some fun looks for your next Disneyland visit. This was one of my favorite outfits. It was comfortable, stylish, and so fun. I purchased the Sweater and jeans at the Goodwill Clearance Center and the fanny pack at Goodwill for $1. My husband found this sweater at Goodwill for $4 last year and I couldn’t wait to wear it to Disneyland. I love the vintage look. I paired it with my favorite high rise shorts and the fanny pack, of course! Getting a solo outfit picture was nearly impossible this day. The park was crowded, my anxiety was high, and I just wanted to enjoy. It was a casual day with my $1 H&M jeans and $1 Disney shirt, both from Goodwill, of course! Can you tell I’m obsessed with cropped sweaters? I loved this hoodie + overalls combo for a longgg day at the park. The hoodie is from the bins and the overalls were $1. Who said you can’t be comfy and stylish at the same time? The top and skirt were both found on dollar day and they were practically made for each other.